"These are a great substitute for children to take to school in lieu of Valentine's Day cards! Use a drinking straw to cut the holes in the pastry." Cream 1 cup butter or margarine and 3/4 cup white sugar together. Blend in egg, 1 teaspoon vanilla extract, and grated lemon peel. Sift together 2 1/2 cups all-purpose flour and baking powder. Add to creamed mixture and blend well. Cover and refrigerate dough for approximately 2 hours. Roll dough to 1/4 inch thickness on a lightly floured surface. 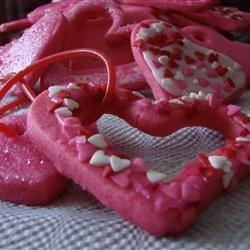 Use a floured heart shaped 1 to 2 inch cookie cutter and cut dough into heart shapes. Place the cut-out hearts on greased cookie sheets. Using the drinking straw, make a hole at the top center of each heart before baking. Bake for 5 to 7 minutes until very lightly browned. Cool the cookies on a wire rack. To Make Butter Frosting: Mix 3 cups confectioners' sugar and 1/3 cup butter together. Stir in 1 1/2 teaspoons vanilla extract and 2 tablespoons milk. Beat until smooth making sure frosting is of spreading consistency. Stir in food coloring to create a pink or red colored frosting, if desired. After cookies have cooled, frost and decorate them with nonpareils, sprinkles, dragees, or colored sugar. Use a toothpick to dislodge the hole, if necessary. Let the frosting dry. To make a necklace, tie the ends off of two pieces of red colored licorice with a knot. Thread it through the hole at the top center of the cookie. Tie the other ends off with another knot to create a "chain." Makes approximately 30 heart necklaces. See how to make tasty cut-out cookies for your sweetheart. So much fun to make! i used some ribbin. Came out great!